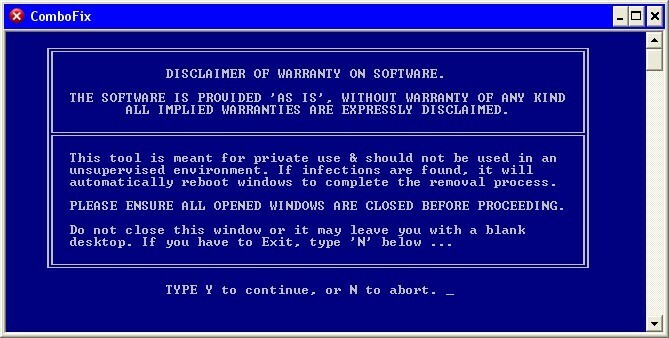 ComboFix is provided as freeware and is distributed as-is without warranty of any kind. All implied warranties are expressely disclaimed. ComboFix is meant for private use and should not be used in an unsupervised environment. If infections are found, ComboFix will automatically reboot windows to complete the removal process. There are many freeware tools that offer value to the user but ComboFix is simply a life saver and with over 30 million downloads, this bit of software has grown quite a reputation and delivers on its promises. ComboFix is an aggressive tool to fight malware and viruses that other system seem to miss and once you run the program a report is generated that shows you what files should be removed from your system. Now with guides in many popular languages, people from around the world can download and use ComboFix on their Microsoft machines. ComboFix was created and delivered as freeware so that you could run the program to scan your system for no cost to you. There are many places that you can get download Combofix so it easily accessible on the internet. Many technical professionals download ComboFix from a job site or carry it around on a thumbdrive saving them loads of trouble and making themselves more efficient and less costly. Thankfully, sUBS created the malware fighter to combat the vicious and cruel bugs that plague our pcs and we are forever thankful for them for having created such an awesome tool. Download ComboFix directly from our site and you will be on your way to erasing those nasty bugs. Use the guides in the top left navigation for an easy to use experience with intructions written in your language! If you like the software and you want to give some appreciation to sUBS, they do accept donations on their Paypal account.